Back in season seven of Supernatural, they introduced a previously unheard-of ancient race of celestial beings called Leviathan. I briefly hoped that maybe season seven would be the Winchesters vs. Cthulu. When Leviathan made their entrance, I realized I’d been a fool… of course Leviathan, like the angels and demons, had to possess humans to exist on Earth. Benito Martinez from The Shield is more cost-effective than a giant CG Lovecraftian horror. Why do I bring this up? Because Runaways and Titans both hit the same problem in adapting their source material… they have villains who are a wee bit tricky to do on a television budget. I honestly don’t know where to begin with these guys. 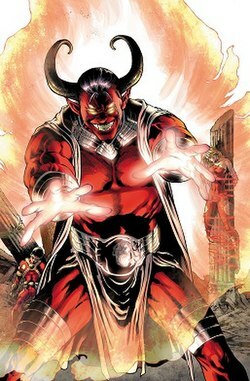 And this is Raven’s father, the world-conquering demon Trigon. He was a six-eyed, two-horned, flying crimson people eater. Is the one on the right wearing mummy-bandage Ray-Bans? Nip/Tuck’s Julian McMahon, not famed for being several stories tall. Flames fueled by just setting their effects budget on fire. 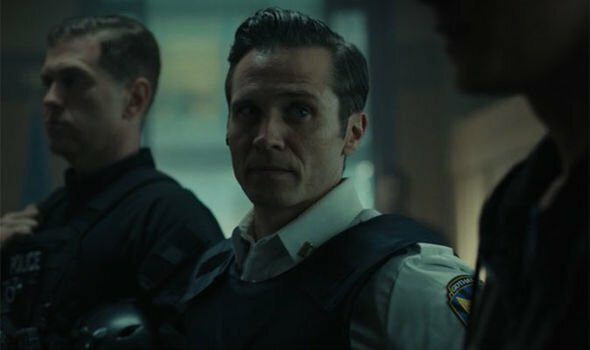 …Seamus Dever, the secondary sidekick detective from Castle. The writers then had to find some ways to justify replacing immense aliens and demons with Handsome TV Actors. 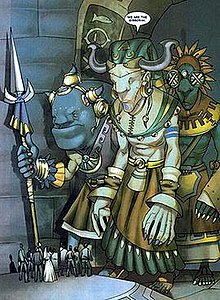 On Runaways, it’s actually a kind of elegant polish to the story… the producers looked at the Deans, who were glowing aliens and like the rest of Pride worked for the Gibborim, giant rabbit-thing aliens, and asked… how many alien races does this first season actually need? Can’t the glowing aliens that look human be our only aliens for a while? And, frankly, yes, yes they can. Turning the Deans from Hollywood celebrities who were secretly aliens into the leaders of a Scientology metaphor, one of whom had an affair with a light-based alien who took over a human host, is much cleaner, and doesn’t ask new viewers to understand why one race of aliens came to Earth to take orders from a different race of aliens. On Titans it allows Trigon to be a much more seductive figure. If he showed up in all of his demonic glory, in addition to possibly looking cheap and tacky, it would make less sense that Rachel might be convinced to trust him, let alone that her mother was seduced in the first place. So… they work. The cheap versions work, and they’re well cast. 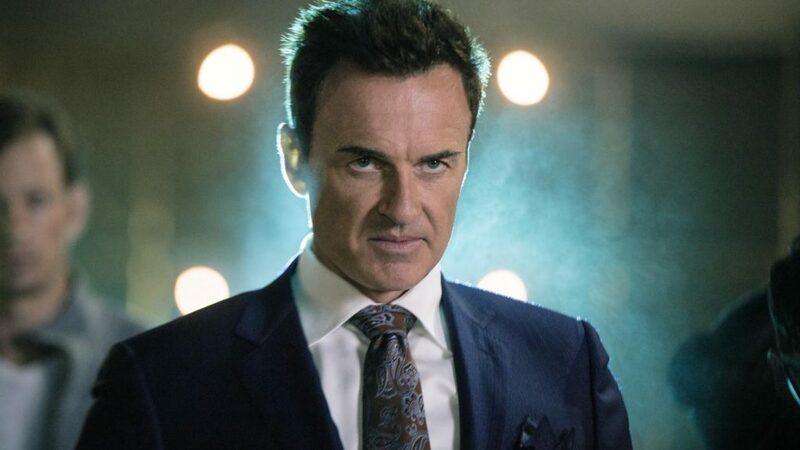 Julian McMahon nails it as Jonah, and Detective Ryan from Castle is surprisingly good as Trigon. You see why the Roth women* trust him, while still intrinsically knowing that they shouldn’t. 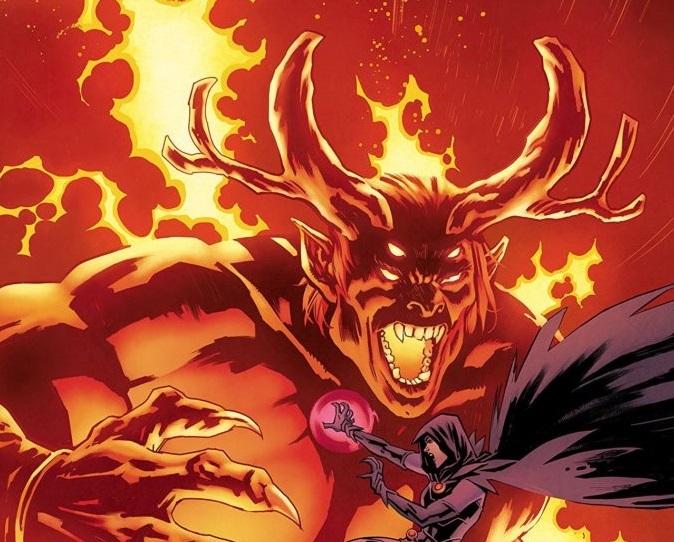 Just if you’re familiar with what the Gibborim and Trigon are like in the comics… adjust your expectations. *Actually Rachel’s mother’s name is “Angela Azarath” and that last name is… it is not a good sign. Not as bad as “Azathoth” but not good.